A gift that celebrates memories is so much more than a present. An occasion for gift giving--the holidays, a birthday, an anniversary--is all about the experience. Everything's better when you enjoy it together. Here's a list of distinctive presents for everyone on your nice list. They are suitable for people of any age. They are affordable as well; most gifts are $10-$20, with many under $10. When you purchase items through these links, I receive a small percentage of the cost through the Amazon Associates program. You can buy curated, high-quality items at the same that you support my work. The ties that bind these gifts together is that they cherish the past or create the future. I would be remiss for not mentioning my book, Creating Family Archives: How to Preserve Your Papers and Photographs, as a thoughtful gift. It's an easy, quick, and affordable guide to protecting your treasures. I've also selected a collection of my favorite Gaylord Archival items for beginners, including family history kits, enclosures, and folders, that I advise my clients to use and that I use myself. I've also created the ultimate archival supply shopping list that goes into more detail about what beginning archivists need to get started. I offer services for individuals and families, with three levels of expertise. 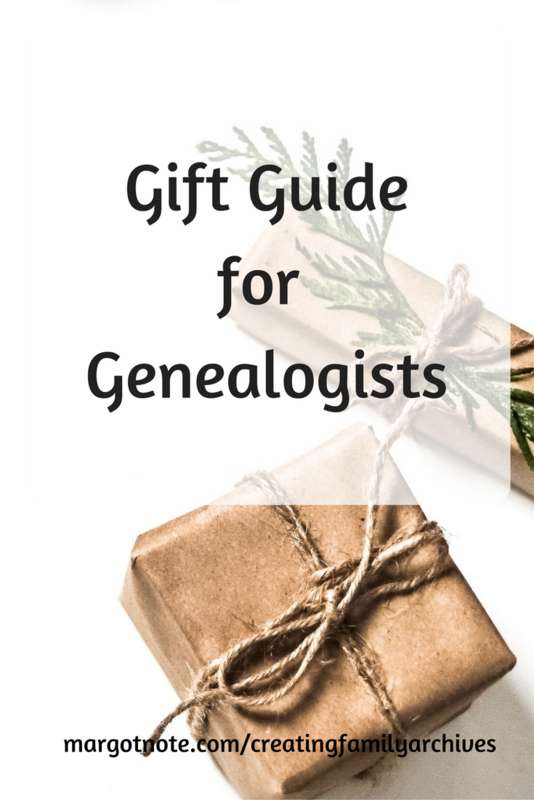 A family archives package is a unique gift for a friend or relative who values their heritage, but doesn't know what to do to protect it. It would be my pleasure to show you how! Learn more HERE. I've created a couple of on-demand tutorials for you to access at any time. Access Organize What's Meaningful to You, Kickstart Your Family Archives Project, or both for additional savings. You will receive videos jam-packed with content, as well as a growing collection of family history tools, articles, oral history kits, podcasts, and other resources; unlimited access to the tutorials; automatic upgrades to any new content, and other goodies. Learn more HERE. Lea Redmond's Letters to... series provides prompts for letters to loved ones. Letters to My Friend: Write Now. Read Later. Treasure Forever. offers 12 letters to celebrate a cherished friendship. A gift of a recipe box with 100 recipe cards (and a potential to hold twice as much) allows family members to record their favorite recipes. I like this box because of its clean, modern design; a groove on the top of the box allows you to view your recipe easily. The Memories line of Homesick candles are the best. The Books scent smells like an older leatherbound book mixed with a woody desk character of cedar and sandalwood. Hints of balsamic and vanilla finish the complex scent. Doesn't that sound wonderful? This hand-poured soy wax candle burns for 60 to 80 hours. Drop a note to friends and family with letterpress printed cards. My favorite is a set individually printed on a 1930's letterpress with a vintage typewriter motif with "just a note" in black on the front. They're blank inside. The cards measure 3.5" x 5" and come neatly packaged with a variety color of envelopes. If these aren't your style, I suggest seeking another set of letterpress stationery; they have a luxe, handmade touch that stands out among slick and impersonal commercial cards. An archival-quality photo album kit includes everything you need to safely present precious family photos in an elegant black album. The kit includes a buckram cover, mounting pages, protectors, photo corners, and envelopes that are acid-free to safely store photos, negatives, newspaper clippings, and other memorabilia. I've written a post about purchasing and using the album to recreate a damaged magnetic album. In Home, artist Carson Ellis makes her solo picture-book debut with a whimsical tribute to the many possibilities of home. I spotted this book at The Strand and was immediately drawn to it. The book has a beautiful tone that invites many return visits. It also introduces the important concept of how the places we live shape our lives. These forest friends bookplates are so cute. The 80 bookplates were illustrated by Quill & Fox. They feature colorful owls, worms, squirrels, foxes, beavers, ladybugs, rabbits, and hedgehogs. It makes a fun gift for the little bookworm in your life. Let's Make Some Great Art is such an inspiring book; it’s full of activities and lessons on artists, and is a great tool to get kids’ creative juices flowing. Nothing beats the ease of taking photos on your cellphone, but there’s something retro about the Instagram-like wallet-sized photos produced from a Fuji Instax. All kids should experience the tangible aspects of photography, especially instant photography. Archivists and conservators are unsure about how long digital images will last. Physical images (when preserved properly) will survive hundreds of years. Paper Love: Searching for the Girl My Grandfather Left Behind by Sarah Wildman documents her journey to find the lost love her grandfather left behind when he fled pre-World War II Europe. The book begins when she finds a cache of letters in his old files, then ends in an exploration into family identity, myth, and memory. In Sidonia's Thread: The Secrets of a Mother and Daughter Sewing a New Life in America, Hanna Perlstein Marcus writes about her journey with her mother, Sidonia, who came to Massachusetts from a displaced persons camp after World War II. Sidonia supports herself as a talented seamstress, yet hides many secrets. As an adult, Hanna searches through her mother's old letters and photographs to find clues about her heritage. The House in Prague: How a Stolen House Helped an Immigrant Girl Find Her Way Home follows Anna Nessy Perlberg's life from witnessing the Nazis invade Prague in 1939 to after the Velvet Revolution in 1989. The book is illustrated with pictures from the author’s family archives. 97 Orchard: An Edible History of Five Immigrant Families in One New York Tenement by Jane Ziegelman investigates the culinary habits of five ethnic families living at the turn of the twentieth century in one tenement on the Lower East Side of Manhattan. It includes 40 recipes. In search of a place to call home, thousands of Hmong families made the journey from the war-torn jungles of Laos to the overcrowded refugee camps of Thailand and onward to America. Lacking a written language of their own, the Hmong experience has been primarily recorded by others. Driven to tell her family’s story after her grandmother’s death, The Latehomecomer is Kao Kalia Yang’s tribute to the remarkable woman whose spirit held them all together. The Blackwing pencil was introduced in the 1930's by Eberhard Faber and was the pencil of choice for Oscar, Grammy, and Pulitzer Prize winners throughout the 20th century. Pencil aficionados from John Steinbeck to Thomas Wolfe to E.B. White have sung the praises of the Palomino Blackwing pencil. After it was discontinued in the 1990's, fans began paying as much as $40 per pencil to seize unused stock. These are perfect for writing in your journal, scribbling down notes as you interview family members, or crafting letters to loved ones. The Fisher space pen is one of the most popular pens of the twentieth century. The original Fisher Space Pen was used on the Apollo 7 space mission in 1968 after two years of testing by NASA and has been used on all manned space flights since then. The design and construction of the pen hasn't changed; it's exactly the same as the one taken to the moon. The pen writes at any angle, even in Zero Gravity, and in extreme temperatures. Writers can jot ideas down quickly with a set of three Moleskine Cahiers. These flexible, singer-bound journals have indigo blue covers and visible stitching on the spine. The ruled pages are acid-free, so they are easy to preserve. For a more substantial notebook, choose Leuchtturm. These notebooks helps you get organized with numbered pages, a blank table of contents, and a set of stickers for the cover and spine that allow for clear labeling and archiving. I've chosen a notebook with plain paper; you can also choose lined or dots (for bullet journals). The Miracle Time Cube is perfect for overcoming procrastination. You can set it to 5, 15, 30 and 60 minutes and research, write, or edit until it beeps. What gifts are you looking forward to giving and receiving?